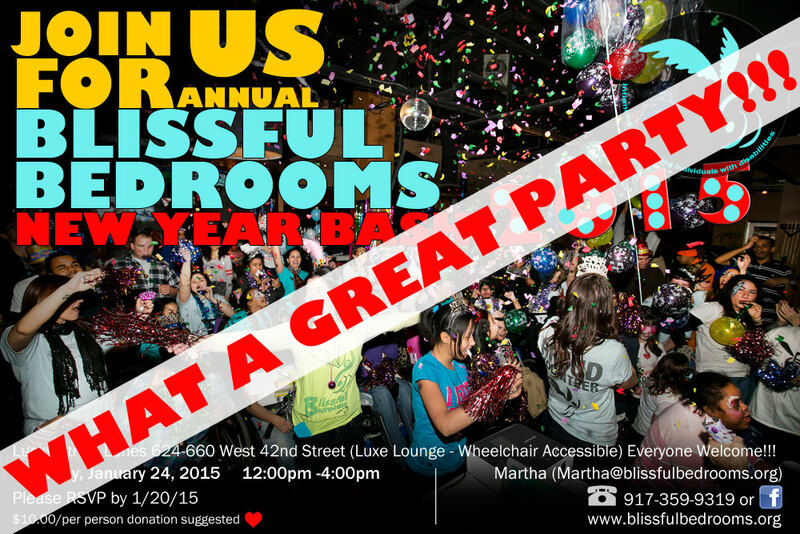 Despite the ominous weather forecast, the Annual Blissful Bedrooms New Year Bash was a joyous and fulfilling event for all who braved the slushy snow and were able to join us! A big, heartfelt THANK YOU to Lucky Strike for sponsoring this much loved and anticipated event, and for welcoming our spirited crew back to their elite VIP lounge for the fourth consecutive year. As always, all of the Lucky Strike staff were extremely gracious and accomodating to us. We hope they all know how much we truly appreciate their kindness and that we consider them part of our family! 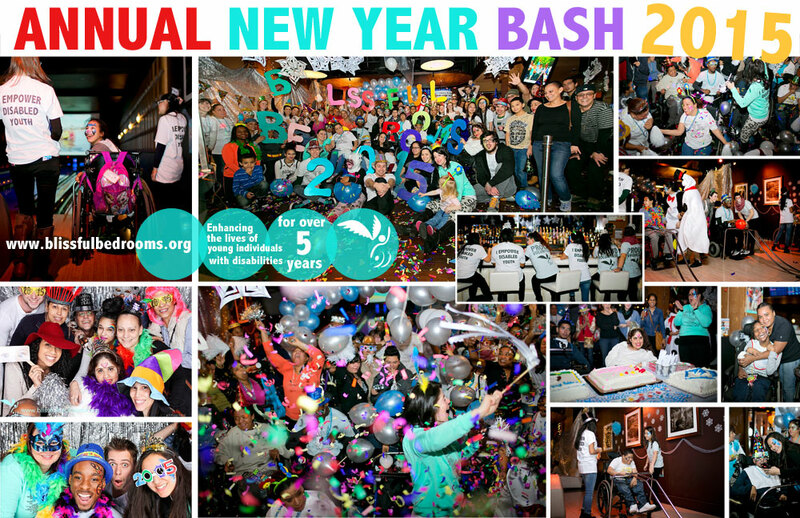 Much love and gratitude to all of the volunteers who were part of Team New Year Bash 2015. A testament to the extraordinary dedication of these Blissful Bedrooms volunteers is that 40/41 of the volunteers, who were signed up to help with the event didn’t let the weather demotivate them and showed up bright and early to transform the Lucky Strike VIP Lounge into a Winter Wonderland, and worked several hours straight to give our guests a fabulous time. Special thanks to Madeline Dudek, and her wonderful students from the High School for Language & Diplomacy Service Club in Manhattan, for contributing significantly to this event. With Madeline’s leadership, her group of 30 students envisioned, planned and created beautiful decorations for our Winter Wonderland themed gathering. All of the service club students wanted to be physically involved in the event, but since they were such a large group, it was decided to pick names out of a hat to establish the onsite team. Seventeen students installed the decorations on the day of the event and performed various job responsibilities throughout the party. Hugs and thanks to Martha’s therapist co-workers at 811x – Claire Ambas, Sandra Esguerra, Jessica Santikul & others, and their students, for crafting dozens of giant snowflakes out of paper during the weeks leading up to the party! A shout out to Onalee Rivera (Onalee’s Face Painting – NYC) and Doreen Zion for generously sharing their time and talents at our event. These two imaginative and kind ladies truly had one of the hardest jobs of the day, as they never had a break the entire party – they painted the faces of every kid and adult on their non-stop line and didn’t pack up their paint palettes until the party was over and everyone was satisfied. These ladies truly brought so much excitement, color and creativity to the shining faces of our guests and we treasure their artistry and loving hearts. Much love and appreciation to Film Biz Recycling, our loyal and committed partners in compassion, for letting us raid their prop warehouse the week before the party and for donating bountiful treasures that helped us create a magical Winter Wonderland set for the Blissful Bedrooms family we love so much.